I have been following closely the recent unrest in Cairo Egypt, for several reasons. For me, it’s been a very interesting development. From Jan 25th, a national holiday to commemorate the police forces, Egyptians have taken to the streets in large numbers, to protest against poverty, unemployment, government corruption and the rule of President Hosni Mubarak, who has been in power for three decades. A few hours ago, the President resigned from office and handed over to the military. The will of the people of Egypt has prevailed! In 18 days, one of the greatest tyrants in recent times was sent packing from his office, by the sheer will of the oppressed people. After about 300 deaths, and over a thousand injuries, Egypt is finally free. The celebrations in Cairo and other major cities will no doubt go on for weeks. What liberation! It is interesting to note that the unrest in Egypt was a ripple effect of the one that happened in Tunisia, weeks earlier, which led to the ouster of President Ben Ali, who has ruled that country for over 2 decades. What is more important to note is that the revolution in Tunisia started with a seemingly minor event that became a catalyst for a wave of events. It all began with a young man, a fruit vendor, whose death might have changed the Arab world forever! Twenty-six-year-old Mohamed Bouazizi, living in the provincial town of Sidi Bouzid, had a university degree (this is being debated, as another report says he dropped out of school) but no work. To earn some money he took to selling fruit and vegetables in the street without a license. When the authorities stopped him and confiscated his produce, he was so angry that he set himself on fire. Amazing! While I am not advocating for people to burn themselves to drive home a point, I have a question that I want to pose to my readers – What price are you willing to pay to effect a change in your life? In your family? And in your world? Selah! This takes me back to 1955, where a woman, by her sheer determination, changed the course of history for all black Americans! It was at this time, that a new law was imposed on racial segregation in the city’s (Montgomery, Alabama) public transport system. The underlying resentment of this law soon came to the fore, when Rosa Parks, an African American woman refused to give up her seat for a white passenger, in a bus in Montgomery, and soon after, was arrested for violating the law. As a consequence of this incident, the public transit system of Montgomery was boycotted by the Montgomery Improvement Association, formed by activists against racism led by Martin Luther King, Jr. This boycott lasted for over a year, and the situation worsened to the point where Martin Luther's house was bombed, and he himself, arrested. This was however, not without success, as by the end of the court ruling, in December 1956, racial segregation in the buses of Montgomery was abolished. Is Nigeria worth dying for? Now, don’t just take that literally. I am not advocating that people should set themselves ablaze in order to start a revolution. I am not advising that we should do what Bouazizi did in Tunusia. What I am asking is this. To what extent are you willing to go in order to improve the standard of living in the country, today, tomorrow and many years to come, thus helping the people and the country in general become more responsible? Are you totally committed to a better Nigeria….if not for your sake, for the sake of your children? As we journey towards another election period, the prognosis is not very encouraging. Many youths remain jobless while 70 percent or our population, mostly in the rural areas, lives in abject poverty. Twenty-six years ago, the late Sonny Okosuns in one of his hit songs asked rhetorically– “Which Way Nigeria?” Apparently perplexed by slow pace of the country’s development efforts, the music maestro expressed his worry over the myriad of socio-economic, religious and political problems stopping Nigeria from reaching the promised land. Okosuns’ pertinent question is still valid. Which way is Nigeria going with its socio-political, economic, and infrastructural development? What concrete actions have Nigerian leaders taken to actualize Vision 2020 which will make Nigeria an El Dorado? Why is the country unable to find lasting solutions to its problems despite its huge human and natural resources? Why is it that at 50, the country is still struggling to provide its citizens with the basic necessities of life? There is inadequate infrastructure and social amenities are practically non-existent because the economy is comatose. Consequently, our political future is still very uncertain. We have a chance to stop this rot. We have a chance to speak out. We have a chance to help restore the pride and dignity of our nation. Even if you don’t burn yourself to make a point like Buozizi, you can cast your vote for the right persons. Even if you are not prepared to spend 18 days in Eagle Square protesting against this government, you can insist that your vote counts. You can stand to be counted. You can make a commitment to be involved in installing the next set of credible leaders. Don’t just fold your hands. Don’t just complain all day. Don’t just lament and curse. May I challenge you to do something? Bouzizi led Tunisians to do something. The Egyptians did the same about their own issue and now they’ve got victory. What are you doing? Get Organized. Get More Done. Setting clear and committed goals won’t work if you can’t organize your resources towards achieving them. How you organize your goals and how often you are reminded of them play a key role in their success. If your goals are collecting dust in a filing cabinet or a folder, they won’t influence your actions. Similarly, how you organize your physical surroundings can give you much greater productivity towards your goals. A messy, disorganized house, office or computer waste valuable time. How you organize your time is probably the greatest factor, and without the ability to control and allocate time to your goals, they will fail before you even start. So you’ve written out your goals on paper. You have described them in objective terms and written a paragraph or two about why you want to achieve them. Below them you have set the deadline for which you feel is both realistic and challenging. Now what? Do you store this file in some obscure folder in your computer? Do you take the sheet of paper and put it into some binder marked ‘goals’ and put it into the dark and cobwebbed realm of your attic? The organization of your goals and how often they serve to remind you are critical to their success. If you never see your goals, they become easily forgotten and they lose whatever significance or meaning they held when they were written. Creating a system where you can see your goals a few times per day and getting organized so you can track the past goals you have set will ensure they stay meaningful. The first step to organizing your goals is to find a system to store them. If you store your goals on a computer, or you prefer a more complex or simplistic scheme for storing your goals, go ahead. If you use a computer a lot, you may want to turn your desktop wallpaper into a goal reminder sheet. This can be a little time consuming if your goals change rapidly, but if you are using your computer frequently, this can be an excellent reminder. Always losing your car keys? Seem to have a lot of stuff just lying around? Being disorganized will damage your productivity, increase stress and make staying on track with your goals more difficult. Organization is a skill anyone can learn and it can save you a lot of time, energy and frustration. Most importantly, being organized creates an environment of productivity and achievement that serves to reinforce your goals. The main culprit in being disorganized is simply that the your items don’t have a home. Whether it is your home, your office or even your computer files, if the items don’t have a specific place they should be stored, they will be pile up in clutter. Losing your car keys is a sign that you don’t have a specific place to put them. 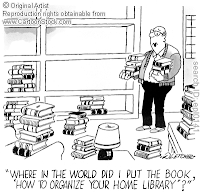 If you are already disorganized, reorganizing everything is a huge task that will take a significant time investment. This is an example where an ounce of prevention is worth a pound of cure. Once you are organized and place things where they belong, only minor reorganizing will need to be done to keep everything operating smoothly. You may need to split this task up into several pieces if you have a lot to organize, but the benefits of being organized are well worth the time required to get there. Start by mentally getting an idea of how you want to organize everything. Chances are you have an idea about where things should go, but by sitting down and thinking about where you want to put things, you can create an effective organizing system. Next go through every single item. Decide whether you want to keep it or throw it out. Unless it is a legal document or holds sentimental value, I’d recommend tossing out anything that you haven’t used in a long time and you can buy again. When you are going through all your items, sort them into the rough groups they will be put into when they are re-organized. Finally take those organized groups and put them back into the place you designated at the start. Organizing your environment may seem costly and unnecessary if you feel that you are just as efficient with some clutter, but it serves an even more important role. An organized environment sends a strong message to your subconscious telling you that you are productive, hard-working and efficient. A cluttered area tells your subconscious that you are lazy, unmotivated and wasteful. As we talked about in the last chapter, the environment you have sends a strong signal to your motivation and your ultimate success towards your goals. Time management is an extensive subject that has been written about in many books. There are many different styles of prioritizing and organizing your time for the greatest effectiveness. This program is not designed or equipped to teach everything there is to know about time management, but it is important enough to warrant a general overview on methods to increase the organization of your time. The first step in time management is deciding what is important. Your goals should already be doing this step for you. If your goals aren’t telling you what is most important, or worse, the objectives of other people are placed on a higher importance than your goals, then your goals won’t work. Ensure that your goals have been broken down until the next action step at any stage in their progress is always apparent. Secondly, make sure your goals are loud enough that they demand your action now. Once you’ve decided what is important, the other step in time management is actually doing what is most important. In this area there are many methods for doing what is important more effectively and efficiently. Depending on your personal style, you might work best by scheduling work in advance or you might work better with a to-do list style that allows you to choose when to work on your goals in the spur of the moment. Experiment with different techniques and styles. If your goals are strong and compelling enough, this phase becomes a lot easier to optimize. I once heard that a successful venture is, “5% plan, 95% execution.” Whatever the actual percentage is, how you execute the progress towards your goals will ultimately make more difference than the planning you use towards them. Having an organized system for reminding you of your goals will allow you to be more motivated and productive and ensure a superior execution.